A common Great Barrier Reef coral species has enough genetic diversity to survive at least 100 years before succumbing to global warming predicts Mikhail Matz of the University of Texas at Austin and colleagues. They report these findings in a new study published April 19th, 2018 in PLOS Genetics. A warming climate, ocean acidification and destruction of coral habitats have all taken a significant toll on coral populations along the Great Barrier Reef. Previous studies offered hope that corals can adapt to warming conditions but no one knows if they can outpace climate change. Matz and his colleagues developed a model to estimate the ability of the common coral species Acropora millepora to evolve by redistributing existing heat-tolerance genes, taking into account the coral's present-day genetic diversity and how far its larvae migrate before settling down. 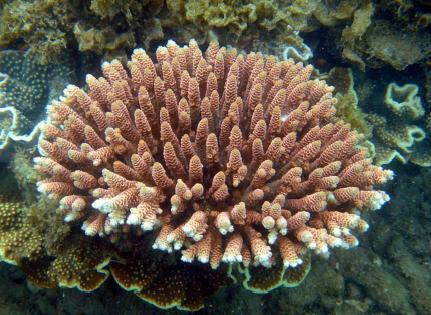 The model predicts that the coral will become more sensitive to temperature swings, which will cause occasional die-offs, but that coral populations will successfully adapt to temperatures along the Great Barrier Reef and survive at least another century. Whether corals will be able to adapt any further is uncertain and depends on several currently unknown parameters of coral genetics. This study of a common inhabitant of the Great Barrier Reef is a rare optimistic contribution to our understanding of how a species can adapt to changing climate conditions. The findings show that recent catastrophic coral bleaching events do not necessary signal imminent coral demise and can also inform reef management strategies, suggesting that interventions that help reshuffle coral genetic diversity among reefs will likely increase the coral's odds for survival in the near future. Funding: This study has been supported by NSF (DEB-1054766) grant to M.V.M, ARC (LP120200245) and University of Melbourne ECR grants to E.A.T., a Coral Reef Alliance grant ("Coral Adaptation Challenge") to E.A.T and M.V.M, Queensland Government funding and AIMS funding to L.K.B.